Hardcover, 290 pp., 14 pls. 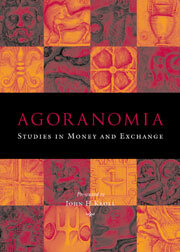 Offered to John (Jack) H. Kroll on his retirement from the University of Texas at Austin, this volume features essays on Greek coinage, exchange, and polis economies from the Archaic to Hellenistic periods. Included in the collection are studies that explore aspects of Homeric and Archaic exchange, the law of sale, and cavalry costs. Other studies examine the social, economic and historical contexts of coinages from Abdera, Athens, “Lete,” Lydia, Mylasa, and Side, and present new interpretative approaches to “cooperative” coinage and those from archaeological sites.